Tom Harvey Award Winner 2017 - Website of commday! 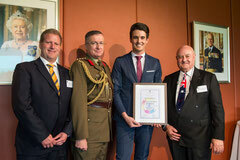 The Hon Max Willis RFD ED CSI, President of the Australia Youth Trust. Max from a young age, had a very strong passion for the luxury hospitality and hotel industry. During studies at the Blue Mountains International Hotel Management School, Max worked for the Park Hyatt Hotel, Sydney, as part of the reopening team during the refurbishment in 2012. Max also worked for the Four Seasons Hotel, Sydney. Upon graduation, Maxi was offered a management position at the Hyatt Hotel Canberra – A Park Hyatt Hotel. Max was employed for 4 years working across a variety of departments within the food and beverage departments. During his time at the Hyatt in Canberra, Max managed a variety of departments and assisted in the creation of large events and promotions, such as the Moet and Chandon Garden Series Events, which Max managed for 3 years. Late in 2015, Max saw an opportunity to return home to his family’s property outside of Eumungerie NSW to spend much needed time with them. A job opportunity arose at Murdi Paaki Regional Enterprise Corporation (MPREC), a non-for profit organization which aims to assist in employment opportunities for disadvantaged indigenous members of the Murdi Paaki Region (which spans throughout Western NSW). Max is currently the Food and Beverage Manager at MPREC Dubbo where he has opened a café, which is one of the corporation’s social enterprises. Max organized various contracts with suppliers and tradesmen, created and organized all operating plans and procedures, purchasing of all equipment and products, menu writing, etc. Every 6 months Max supervises a new intake of long term job seekers that are brought on board where they complete a course which teaches them barista skills, hygiene practices and food safety. The course will last for 6 weeks and then they will become employed by Max to work in the café. Coming from a luxury hotel background Max aims to teach the staff a level of job readiness and skills, which then will assist them in moving forward to any type of career. Max will also assist in resume writing activities, how to conduct yourself in interviews, grooming policies, what is expected of an employee, and a strong focus on working together as a team. These skills are not readily available to learn in society, with Max’s specialized knowledge from working at the highest level in the corporate hospitality industry he aims to help in the professional growth of the individuals and thus break the cycle of unemployment within the indigenous community. As well as teaching, Max also mentors the staff through their journey to professionalism. There are challenges with the staff at times, as a lot of them come from unfortunate upbringings and backgrounds. Issues like drug and alcohol problems, domestic violence cases and family and home issues; these are faced on a regular basis. However, during the time of employment Max sees tremendous growth both professionally and personally in the team. Max was awarded the Social Responsibility Award at the Blue Mountains International Hotel Management School Alumni Awards in Sydney, which recognized the work Max is doing with MPREC. At the event, Max was able to network with hospitality managers and directors from around the world, and inform them of the opportunities that the industry can take out in rural Australia.